There are end number of facilities provided by the banks to its customers, apart from the basic lending of money and accepting deposits. Direct Debit and Standing Order are two such facilities, which the customers can avail, in order to ease their monetary transactions. The former implies a facility, in which the payee is authorized to draw the amount due for payment from the account of the payer, while the latter denotes an instruction given to the bank by the customer to pay/transfer certain sum at regular intervals to the payee’s account. In direct debits, the amounts can vary month to month, whereas in standing order the amount remains unchanged. 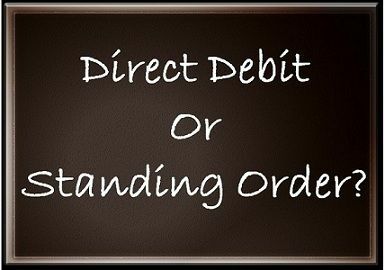 In this article excerpt, you will find the fundamental differences between direct debit and standing order. Meaning Direct Debit is a system of payment in which the bank account holder can authorize the customer to withdraw the due amount, directly from his bank account. Standing Order is an instruction given by the bank account holder to the bank to pay a specified sum at periodic intervals to another person's account. Direct Debit is an automatic payment system, in which you can authorize your customer (institution/organization) to withdraw money from your bank account, as and when the payment becomes due. But, the organization ought to give prior notice regarding the timing and amounts of withdrawals. The bank account holder instructs the bank to straight away honor the payment request received from specified payee. In this system, the payee can withdraw any sum at any point in time. The payee is having ultimate control over the payments to decide the amount and time for payment without taking further authorization from the payer. The payer will not have any control over the withdrawals, but he can cancel them anytime and need not mention any reason for that. The Direct Debit System notifies the payee for cancellations or failures in payment if any. Example – Gas Bill, Electricity Bill, Mobile Bills, etc. Standing Order is a facility provided by the banks, in which you can instruct the bank to transfer a specified sum from your bank account at regular intervals. It is also known as Standing Instruction or Banker’s order. In this system of regular payments, the payer the right to set up or change or cancel the payments without previously notifying the payee. This system is mainly used to initiate payments that fall due on fixed intervals, and their amount is also certain. However, it is also the drawback of standing order that the amount is set, and so if there is a little bit of change in the amount, you need to cancel the old one and make a fresh account. This ultimately increases the administration cost. Example – Rent, Insurance premium, Subscriptions, Equated Monthly Installments (EMI), etc. Direct Debit is defined as a banking transaction in which an organization is permitted to withdraw funds from another person’s account. Standing Order is an instruction given to the bank by the customer to make regular payments on behalf of the customer. In direct debit, the payee is having full control over the payments. Conversely, standing order only the payer can control over payments. In direct debit, the transaction amount may vary from month to month, whereas in standing order the amount of transaction is already fixed. In standing order, the withdrawal intervals are predefined which is not in the case of direct debit. The administration charges in standing order are higher than direct debit. Standing Order is simple as compared to Direct Debit but its main benefit is its flexibility that strengthens the relationship of the organization with its customers. Automatic notification is provided to the payee for cancellation by the direct debit system. On the other hand, no notification is given in the case of standing order. The two systems of automatic payment save your time and effort as well as you don’t need to remember the due dates like when you bill becomes due for payment or when your rent is outstanding. However, the choice between direct debit and standing order is a little difficult, but if you think, logically it is very easy to decide which system suits you better. Let me tell you if there is variation in the sums and the frequency of payments; then you may go for direct debit but if the sum if fixed and you have to pay the amount at regular interval then nothing is better for you than a standing order.